Cult J-Horror filmmaker Kiyoshi Kurosawa (Cure , Pulse ) has been on a hiatus for around a decade now. While he keeps churning out interesting looking films every other year, most of them fizz out becoming a bloated mess or fail to garn the kind of initial promise they show. With "Before We Vanish," a sci-fi riff about an alien-invasion, he delves into a similar kind of mess indulging in a low-key, genre balancing act. Thankfully, there's an abundance of charm in the film. One that really touches you before it vanishes into the end credits. First screened under the Un Certain Regard at Kurosawa's favorite Cannes Film Festival, "Before We Vanish" can be best described as a cross between "The Invasion of Body Snatchers" (1956) & "Arrival" (2016). Mixed with Kurosawa's brand of absurdist satire and an investigation of human nature, the film is ultimately too charming for long-time fans & a little too bloated for newcomers. Even so, there's a glimmer of hope here that keeps this film from dying out on you. The Japanese title, which literally translates to 'Strolling Invaders,' can give you an insight of the intentions of the 3 aliens at the crux of the film. They aren't the usual chaos inducing oblivious fellows (even though the opening monologue might hint otherwise) but they believe in chilling out and getting their head into knowing more about the various tractions that human beings value the most in their life. In doing so, they aren't completely brainwashing the humans of their emotions and values, but only providing them with a kind of hilarious freedom which further helps the film gain some momentum. At the center of the film is a dissipating marriage between illustrator Narumi (Masami Nagasawa) and Shinji (Ryuhei Matsuda). Shinji has been a victim of the aliens sembling into humans which is why Narumi is ignited to see that her good-for-nothing-cheating-husband still has leverage for a slight catharsis. He seems totally off his grid and becomes more sensitive to things around him. 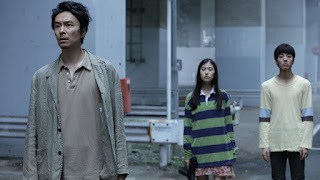 The other narrative arc follows Sakurai (Hiroki Hasegawa), a local journalist who gets involved in the investigation of the gruesomeness in the opening monologue. 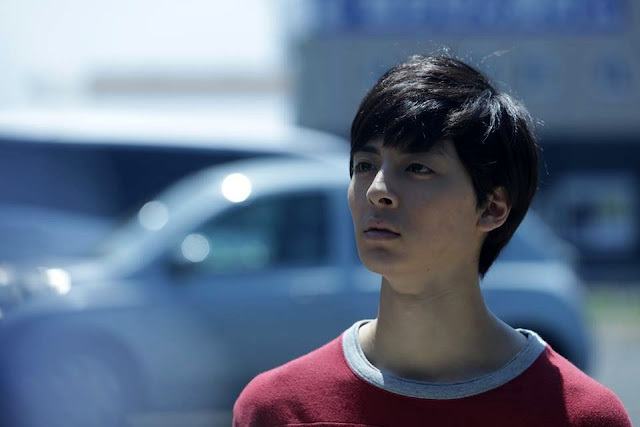 He stumbles onto Amano (Mahiro Takasugi), a young kid who wouldn't stop being weird about his motives. When he tells him he is an alien, Sakurai becomes interested in the intentions of the kid, who might also lead him to a possible breakthrough in his journalistic career. Unlike Kiyoshi Kurosawa's previous directorial effort "Creepy", this film doesn't wish to keep the audience in a constant state of suspense. Instead, we straight away know that the three characters which we are supposed to follow are aliens. While it does make the whole Health Department subplot totally irrelevant, it helps to build up the film to a more cohesively relevant and more humane stage. Through the three aliens, Kurosawa tries to explore what keeps a person going. In a world where everyone is trying to shoo off the lesser person to get their own ways, he explores how certain values and ethnicities simultaneously make us grow and hold us back. But most importantly, the film, in its final moment, poignantly explains the reason for human existence. Which brings us to Sakurai's involvement with these weird kids. While Kurosawa does explain why this journalist would really have a hard-on for the end of the world, he doesn't necessarily give him a kind of redemption arc that he needs. The whole pre-climax bomb-fiasco really brings the whole film down to a shuddering stop. If it wasn't for the endearing romance between the husband and wife that somehow works more than anything in the film, this would have become a complete mess. For cynical audiences, the whole journey might sound like a tad bit too long for something that we truly know within ourselves. But, in spite of the bloated pre-climax, "Before We Vanish" makes for a charming alien-invasion film that is a thankful diversion from Kiyoshi Kurosawa's body of work.